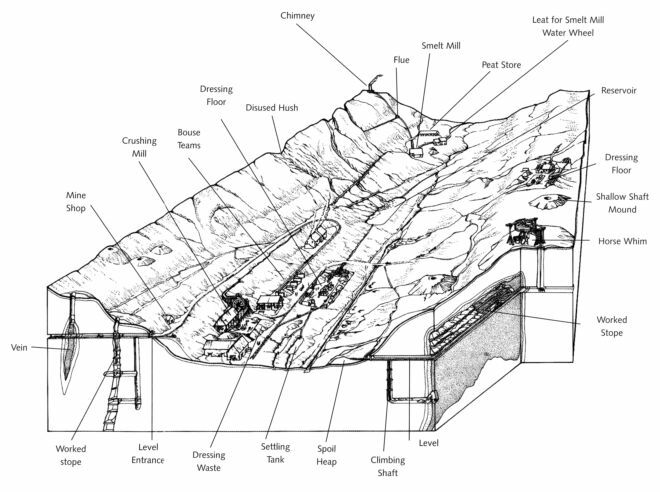 The diagram below is a reconstruction of a mining landscape. It illustrates the various areas of a mining landscape and how they were interconnected. Note the vertical nature of the lead veins, and how the miners used Stopes to cut upwards and downwards into the veins. The Stopes are accessed via levels and shafts from the surface (bottom left). The worked out Stope (bottom right on the diagram) shows the danger of entering mines today with wooden platforms within the Stope holding piles of deads. The shallow shaft mounds shown are also known as bell pits.